Gross Area: 66,300 sq. ft.
Area Per Student: 147 sq. ft.
Nice creation of formal and informal small group, large group and presentation spaces, with high levels of transparency and plenty of natural light and color. 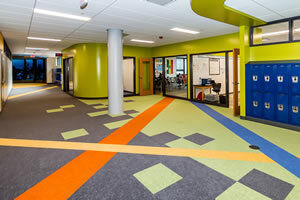 Create a middle school by adding and renovating the space necessary for the existing Jr. High School to absorb over 300 6th grade students and staff. The additional challenge was to transform the environment to support the new International Baccalaureate program. formal and informal small group, large group & presentation spaces. The program was synthesized through a multi-month process of surveys, data analysis, and in-person departmental focus groups. 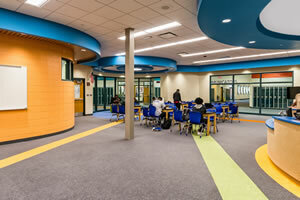 a reimagined cafeteria, larger art & music spaces, and an expanded, open learning resource center. access to the existing, empty courtyard. The addition is anchored with a variety of presentation spaces on both ends, promoting one of the major themes of the curriculum. 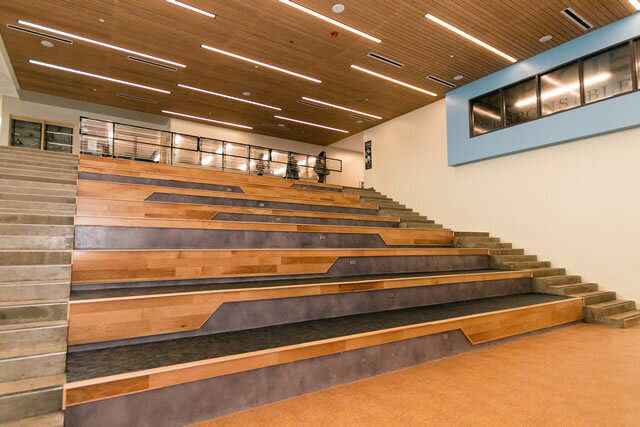 The 120-seat amphitheater features an integrated projection system with microphone and speakers for guest speakers and student presentations. 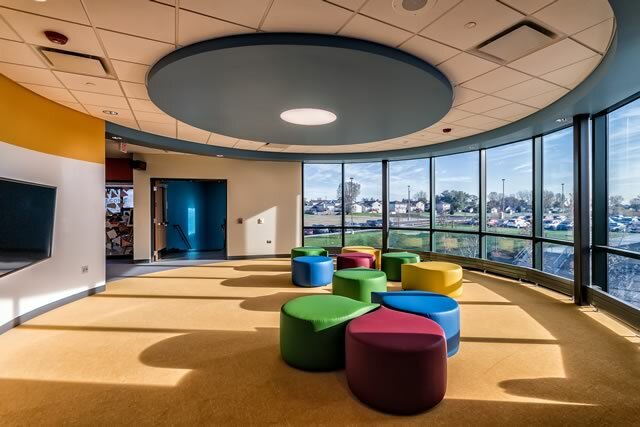 The rotunda on each floor serves as a small presentation or group work area that can sit up to a classroom of students and includes a display monitor with in-wall audiovisual interface. Additionally, renovation of the theater improved seating, lighting and sound systems of the space, giving a total of four dedicated presentation areas within the building. Four small group rooms line the corridors of the addition, each with a writable wall surface and display monitor. These rooms are signed out by staff and students for collaborative group work and project work. Likewise, locker nooks set back in the corridors allow for informal peer-to-peer breakout spaces. The unscheduled “chill spaces” are available for study or as collaborative workspaces during the school day. Professional development rooms, by definition collaborative spaces encouraging interdepartmental advancement, may also be used for one-on-one teacher-student tutoring sessions. 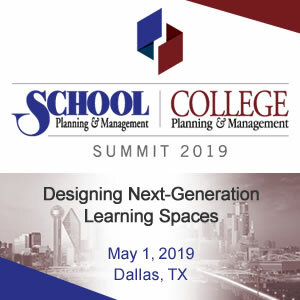 Classrooms are 15-20% larger than the average classroom in the existing building; furniture and student groupings can be rearranged as required for the subject matter. To encourage active learning activities, each classroom is equipped with one entirely writable wall surface that doubles as the interactive projection wall. To implement the District’s plan of one-to-one computing, each classroom has wireless connectivity. Large tackable cork display surfaces are placed adjacent to the classroom door and along the entirety of the wall opposite the projection surface, both visible within the room and the corridor. 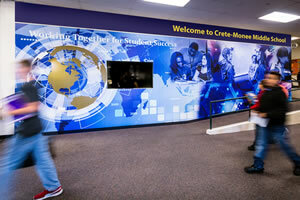 Integrated technology and display opportunities are further enhanced in the three new science labs and three new design tech labs. 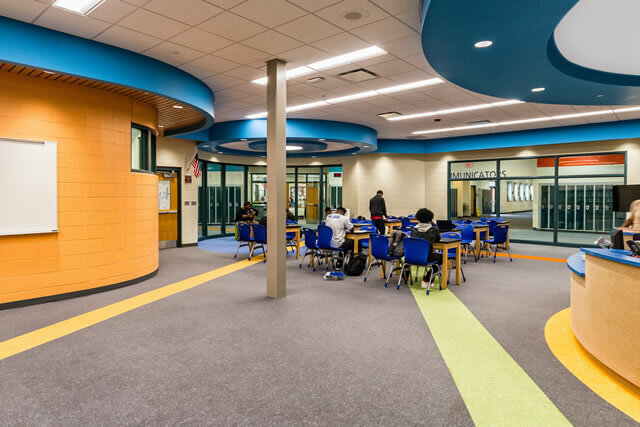 Electrical cord reels hang between ceiling clouds giving the teacher and students power on demand at virtually any location within the room without cords on the floor interfering with furniture or activities. A teacher demonstration station provides power, water, and gas at the projection wall while a portion of the station is set on casters allowing for movement of lab demonstrations within the room. An experimentation bar hangs within the space for use with gravity and load-based experiments. Casework within the rooms features a writable laminate surface to further increase the interactive learning and display area. 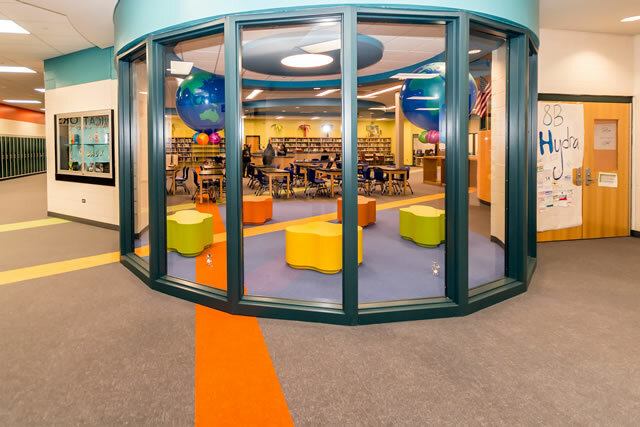 While the classrooms and small group rooms are outfitted with writable and tackable surfaces, the rooms themselves have large glass panes in the corridor wall putting the activities within those spaces on display as means of passive learning. The entire opposite side of the corridor is covered by cork display boards, each imprinted with one of the content area themes of the International Baccalaureate program. The boards are intended to display student work throughout the school year, but the printed theme will convey the learning tenets whether student work is available or not. Five display monitors are placed throughout the building – one in each rotunda, the main “chill space,” the main entrance and in a nook off the corridor in a corner of the existing building largely untouched by the project aside from cosmetic upgrades. These monitors are interactive presentation tools for students and teachers, when not in use they’ll communicate information such as daily announcements, information on books of the month, and updates on student projects. 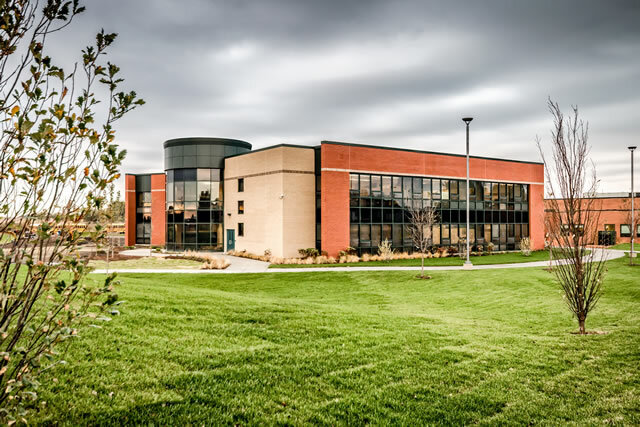 The two-story addition is placed over the existing parking lot to the east of the existing building, using the remodeled Learning Resource Center (LRC) as the central node from which to circulate through the building. 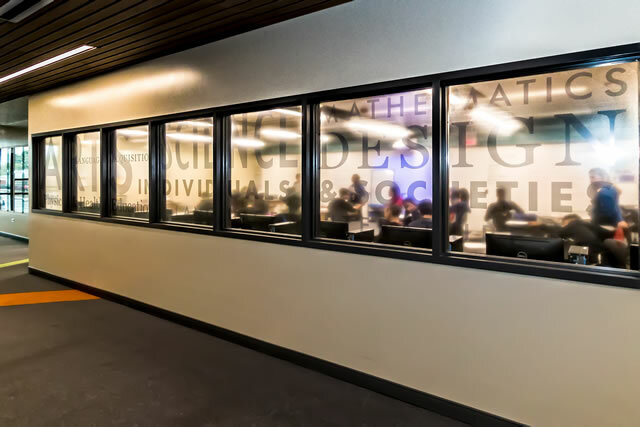 The LRC features large expanses of glass creating a more transparent and identifiable building hub assisting both wayfinding and meeting one of the ultimate curricular/educational goals of putting learning on display. 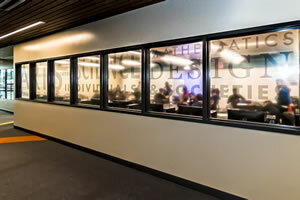 A computer lab that previously resided within the LRC is placed in its own space adjacent to one of the addition’s “chill spaces” with a glass partition serving as the separation, allowing for a direct visual connection from the existing building to the addition as well as passive supervision of the “chill space” by staff. 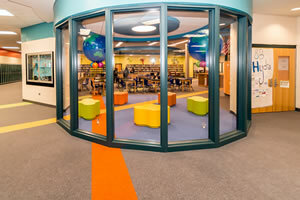 Upon entering the addition from the existing building, the space opens from a single story passage to a two-story open amphitheater flanked on the north by full height curtain wall, the west by a projection wall with a writable surface and the east and south by classrooms that physically overlook the space. A glass and metal railing system serve as a means to both provide transparency and material contrast to the wood, concrete, cork and grass-inspired carpet intended to bring the outside into the focal point of the addition. Core spaces include professional development rooms for staff collaboration and a special education suite. The professional development rooms act as hybrid faculty lounges and offices with dedicated workstation space for nine to ten people, a kitchenette, a copier and open central space for tables and chairs. In the addition, two special education classrooms are linked by a changing room, a sensory room and a staff office with glass viewing panes to allow for parent observation of multi-needs students during parent-teacher planning sessions. In the existing building an open, unused queueing area between the existing theater, gymnasium and cafeteria were repurposed as the primary “chill space” in the mold of an adolescent coffee shop with colorful accent light fixtures, flexible furniture, countertop seating, a flat screen display and charging stations for laptops and phones. The existing theater features new seating, flooring, lighting and sound systems. 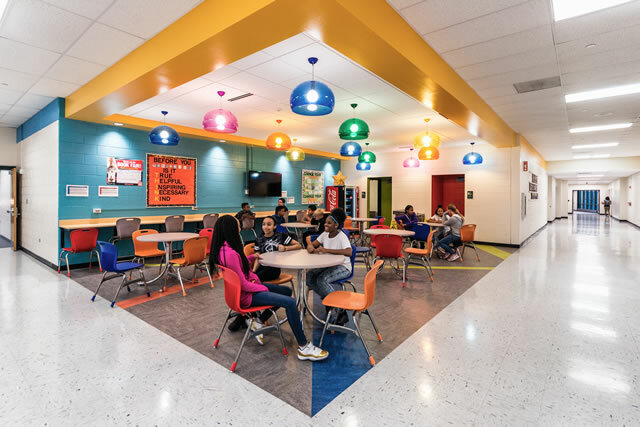 A cafeteria addition, necessary to accommodate the school’s 300-plus additional students is able to be partitioned off by a folding glass wall system which enables the space to be used as an extra classroom or meeting space outside of midday food service. The expanded band/choral room allows for larger populations by taking a portion of the space remaining from the relocation of the art room to the addition and using it for band/choral storage. A dedicated faculty lounge is located at the west end of the building, closer to the school kitchen. The relocated, expanded main office sits adjacent to an expanded secure entrance vestibule and provides dedicated conference space, a workroom and kitchenette. The space vacated by the main office contains a standard classroom and a design tech lab. Color schemes from the addition are brought back through the previously monotone white building with new paint throughout the corridors and permanent displays at the main entrance and the theater. Structural Engineer: KJWW Engineering Co.
Electrical Engineer: KJWW Engineering Co. Mechanical Engineer: KJWW Engineering Co.
Technology Consultant: KJWW Engineering Co.